The Churchill Residence In Ojai was granted landmark status by the County of Ventura in 2018. More information about the Churchill Residence in Ojai and the owners can be found online. 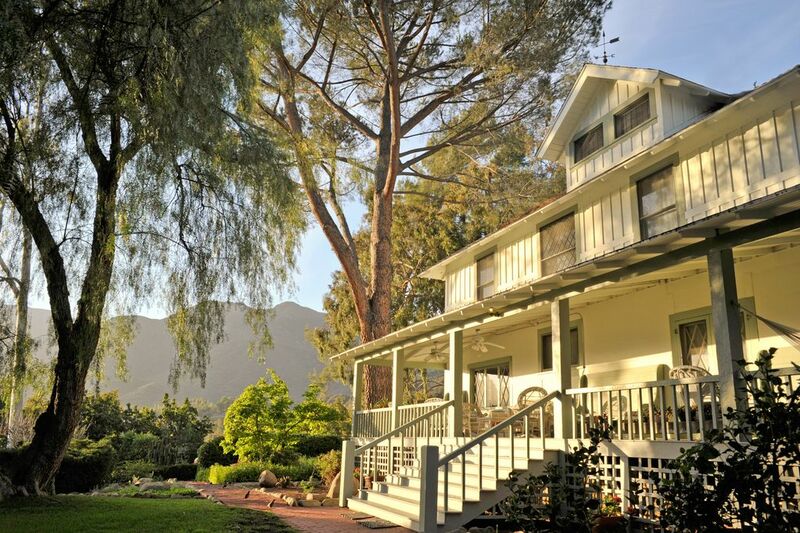 A spacious Craftsman farm house, the historic Churchill Residence is located in the east end of the Ojai Valley, a half block from Thacher School and the Krishnamurti Foundation. Originally part of the historic Pierpont property, the 3,600 sq. ft. house was designed and built in 1905 for Civil War veteran General Charles G. Penney. The second owner of the house was Dr. Guido Ferrando who along with Aldous Huxley, and J. Krishnamurti founded the Besant Hill School (formerly Happy Valley School). The residence has been owned by the Churchill family since 1957. A short drive from Ojai Town Center, the residence is set back one-tenth of a mile from Thacher Road. Amid orange and avocado orchards, the location is private and serene. Landscaped grounds compliment mountain and valley views from verandas on the front and back of the house. The residence is not recommended for groups with children for reasons of their safety and potential damage. A peaceful, rural retreat: The Churchill Residence is popular for groups of friends, writers, artists and Thacher families. It's secluded and peaceful, a great place to have a family reunion, catch up with friends, read, think, create. There are many cultural events in Ojai throughout the year. Don't miss the Sunday Farmer's market and Bart's Books. Note: There are three security cameras on the property, all look out from house. There is one at the front entrance, one at the laundry room entrance and one with a view of the driveway. Several kinds of coffee makers, including programmable. Very comfortable house with gorgeous views. The house, the porch, the gardens, and the pool were perfect for our family, and the setting could not be more spectacular. Especially the orange blossoms. Our family has rented several homes in California over the past 7 years and this house was the resounding favorite of everyone! Incredibly scenic with a great hot tub and pool. We cooked several meals at the house and ate on the porch with views of the mountains. The bedrooms were all spacious with comfortable beds and great linens. The gardens and orchards of oranges and avocados surrounding the house were a nice feature for New Englanders. Joan and Julie were very helpful planning hikes and meals in the surrounding area. We’ve stayed at this property twice, with 2 different groups of people, and we just loved it. It’s a historic house with an old California feel to it — lots of charm. There are many common rooms on the first floor so we never felt on top of one another. Some of us watched a movie, while others played games, and some did work. It’s great for our family get togethers. The house is warm and charming but the setting is unbelievable. Would absolutely recommend staying here. Particularly lovely for a group. We loved our weekend stay in this historic house. The views are magnificent, and you can't beat the location right next door to our kids' school. Thanks for a great stay! We had such a wonderful, relaxing weekend. The house is charming, beautiful, and historical with plenty of room for our entire group. We lounged by the pool, utilized the jacuzzi, and did a 1000-piece puzzle during our stay. I have to specifically mention the outdoor shower, which was amazing and perfect for a hot day. We would definitely love to come back, thank you for everything!